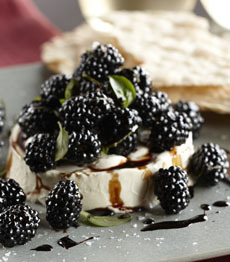 This fresh blackberry dessert is sophisticated yet so easy to make and serve. A tub of mascarpone turns into a sophisticated spread when topped with a simple mixture of balsamic vinegar, brown sugar, blackberries and basil. Serve it with biscotti, cookies/biscuits or unsalted crackers, and guests will be asking for the recipe. This recipe is from Driscoll’s. Prep time is 15 minutes, cook time is 5 minutes. Mascarpone spread, a delicious no-cook, no-bake dessert. Photo courtesy Driscoll’s. 1. BRING vinegar and brown sugar to a boil in a nonreactive small saucepan over high heat. Boil until reduced to 2 tablespoons. Pour into a medium bowl. Let cool. 2. GENTLY STIR in blackberries, basil, pepper and salt. 3. FILL a bowl with hot water. Dip bottom of the mascarpone container in water for about 5 seconds. Using a rubber spatula, unmold mascarpone onto a serving platter. 3. SPOON blackberry mixture over mascarpone, being sure to scrape all juices out of the bowl, and letting berries fall randomly. Serve with biscotti, cookies and/or crackers. *Examples: almond cookies, butter cookies, cream crackers, digestive biscuits, graham crackers, ginger snaps/ginger bread, ladyfingers, Moravian cookies, pizzelle, shortbread, speculos, springerle, stroopwafel, tea biscuits, water biscuits, wafer cookies, wheatmeal. Blackberries grow wild around the world, and in most places they are picked in season, not cultivated. Cultivation is relatively modern and done mostly in America [source]. The blackberry is a member of the Rosaceae family of flowering plants. The largest genus in the family is Prunus, which includes almonds, apricots, cherries, peaches and plums. The blackberry is a member of the Rubus genus, which also includes dewberries (which look like raspberries to the untrained eye), raspberries and hybrids such as boysenberry, loganberry and tayberry. The blackberry isn’t black, per se, but a very deep purple. It is not the same as a black raspberry, Rubus occidentalis, a raspberry grown on a limited basis*, primarily in Oregon. What distinguishes the blackberry from the raspberry genus is that its torus (receptacle or stem) “picks with” the fruit. When picking blackberries, the torus comes along with the berry (as you get with strawberries). With raspberries, the torus remains on the plant, leaving a hollow core in the raspberry fruit. 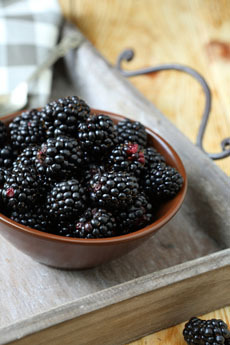 Blackberries typically peak during June in the South, and in July in the North. You can enjoy a simple bowl of berries at breakfast, lunch (add them to green salads, enjoy them for dessert), dinner or for snacking; for drink garnishes on a cocktail pick; or use them in recipes. *Black raspberry plants yield significantly less fruit than red raspberries, and also commonly suffer from a disease complex that gives them shorter lifespans. They are more costly to produce on a large scale.